Used portable wheelchair ramps can be an ideal accessibility solution depending on your situation. For example, if you have been injured and temporarily require a ramp while you recover, we suggest looking into our used portable ramps. If you need a ramp just for a short length of time, then it doesn’t make financial sense to invest in a brand new portable ramp, or have a modular ramp installed in your home. Other situations in which you may need used portable wheelchair ramps are when you may not know how long you’ll need it for. Or maybe you have friends or family staying at your home with accessibility needs, in that case a portable ramp is a fantastic way to accommodate them. Here at Williams Lifts, we are happy to offer our customers the absolute best used portable wheelchair ramps available, designed to assist in the mobility and get you where you need to go. Our selection offers flexible solutions, whether you need a ramp to access your home, vehicle, or navigate thresholds, curbs, entrances, or anything else — we’ll provide the solution to make it possible. Used portable wheelchair ramps from Williams Lifts are available in several different designs at competitive prices. They are affordable, dependable, easy to store, and easy to transport. In addition to the ease of use, they are also extremely convenient. Unlike other wheelchair ramp solutions, portable ramps require absolutely no installation. They fold up nicely after use, and have built in handles to carry from one place to another. There is no sacrifice in quality when opting for used portable wheelchair ramps over a more permanent solution. Even though they are lightweight, their aluminum construction makes these ramps study, durable, and strong. All used portable wheelchair ramps are made to use either indoors and outdoors, with safety and traction in mind. Let us be your provider for accessibility solutions. We offer a number of safe, inexpensive portable ramps to meet your individual needs. We keep them readily available in stock, and get them to you within a day or two. If you’re still not sure whether this solution is right for you, come in and visit our showroom. Our team will assess your needs and help you find the best used portable wheelchair ramps to meet your individual requirements. 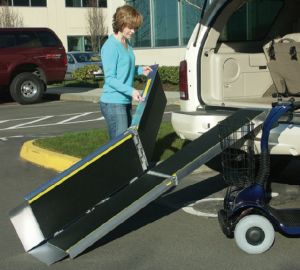 Another benefit of choosing Williams Lifts is the fact that we can get a portable ramp out to you fast. We know that it’s like to suddenly find yourself requiring a mobility solution — you wish you had it yesterday. While we can’t quite get something to you yesterday we’ll get a portable ramp to you as soon as humanly possible. As an independent, locally-owned small business, we’re capable of providing friendly one-on-one service that you won’t find elsewhere. We take the time to get to know our clients and build lasting customer relationships. If you have any questions about used portable wheelchair ramps, or about any of our products, please leave a comment below or fill out our contact form on the right sidebar.